Comfort Fit Platinum Milgrain Bands Directory Buy Here! the exact thickness of a band so you can not compare price. die struck bands, or they are trying to mislead you. and it does not matter which alloy is the other 5%. Either Ruthenium or Iridium is acceptable. 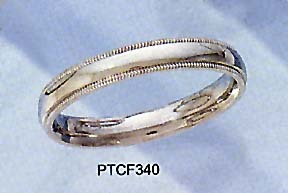 Remember these are trace alloys which have no material effect on the price or value of the ring. Also look for hidden "restocking fees" which we've seen to be as high as 20% or more! We've also found that it can take up to three weeks for our competitors to process an order! These bands ship in 48 hours or less! See order page for details.